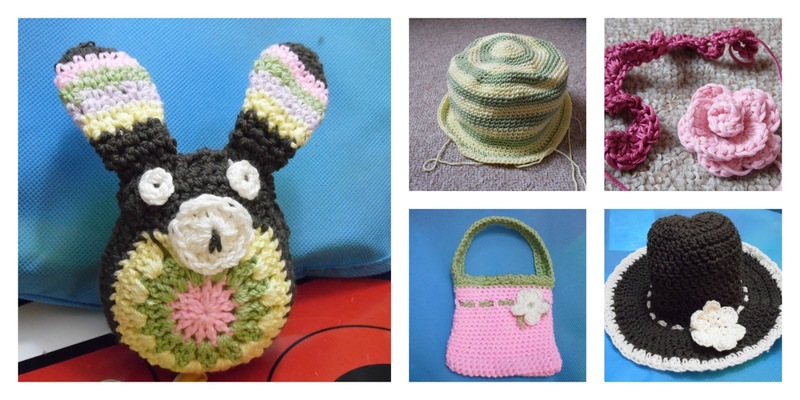 Well, as I started my challenge a few weeks early (so that I have time to list all the items for sale in time for an auction on 15th May) I am now in week 4 of my challenge and have a bit of catching up to do on the blog. I've decided the best way to do this is provide you with an overview, and if you want more details of the patterns and yarn used then please do visit my personal blog. So that's Hopper the Bunny, A Lady's Sun Hat, 2 May Roses, A Child's Handbag and a Baby's Sun Hat. I've also just received my yarn donation (30 balls of yarn!!) from the wonderful Black Sheep Wools. I am dreaming up colour combinations and trying to decide what to create from this beautiful yarn. This is my first play with the colours, a girl and boy mix with two colours spare for smaller projects. I must dash now as I have patterns to look through, projects to finish, and more bits and pieces to sort out. I'll be back soon with another update, so stay tuned.